Friends have been raving about this amazing curry in a giant bun dish that is delivered piping hot to your home. I finally got to try it when my parents served it at dinner one day. What a surprise when we finally took it out of the box. 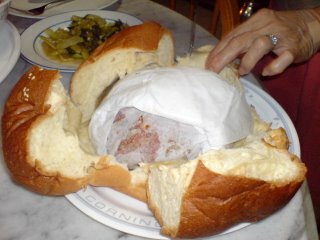 The curry in the bun (that looked more like a giant loaf) was actually wrapped in a paper to prevent it soaking through the bread. Also the curry was but average. We had the mutton curry version that I found too rich, while the meat was simply tough.